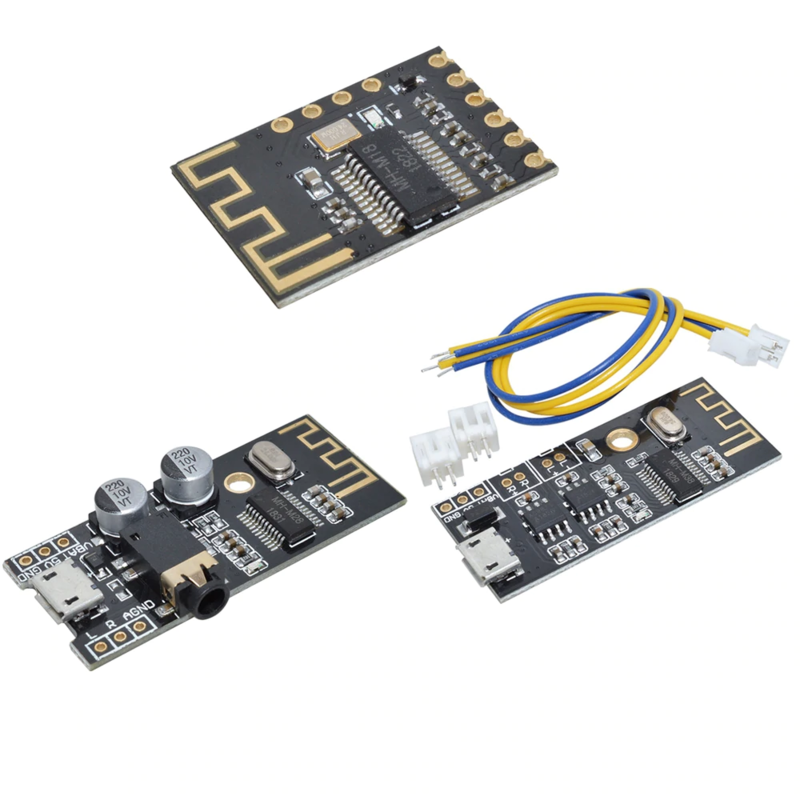 Sensing distance: up to 5 meters; recommended 0-3.5M. 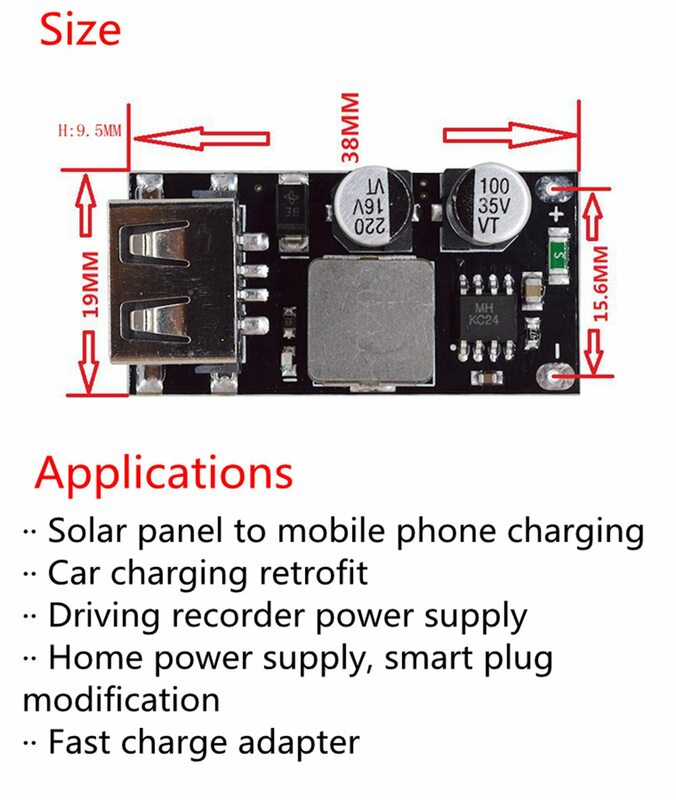 This module has high sensitivity, fast response, small static power consumption, small size, easy to install, and is installed. Access control on-demand imaging, automatic equipment for agriculture, forestry and mining. 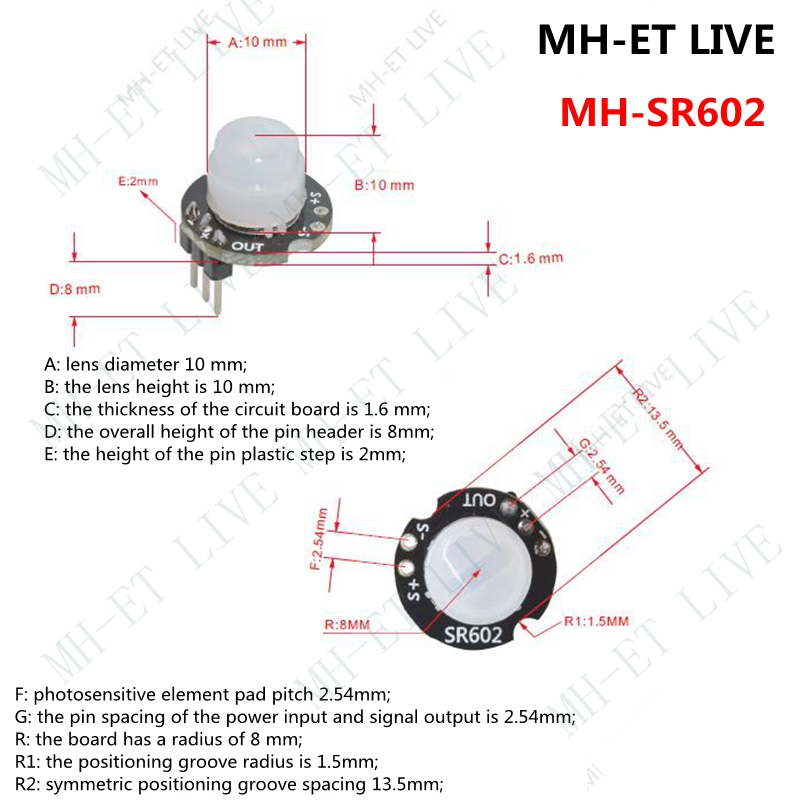 The high level time of the output of this product is adjustable, 2.5 seconds to 1 hour, the output time set at the factory. 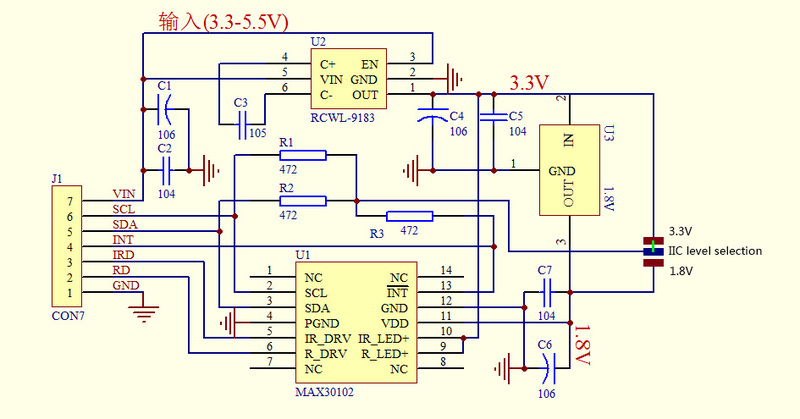 It is 2.5 seconds, and you can change one chip resistor if you need to change it. 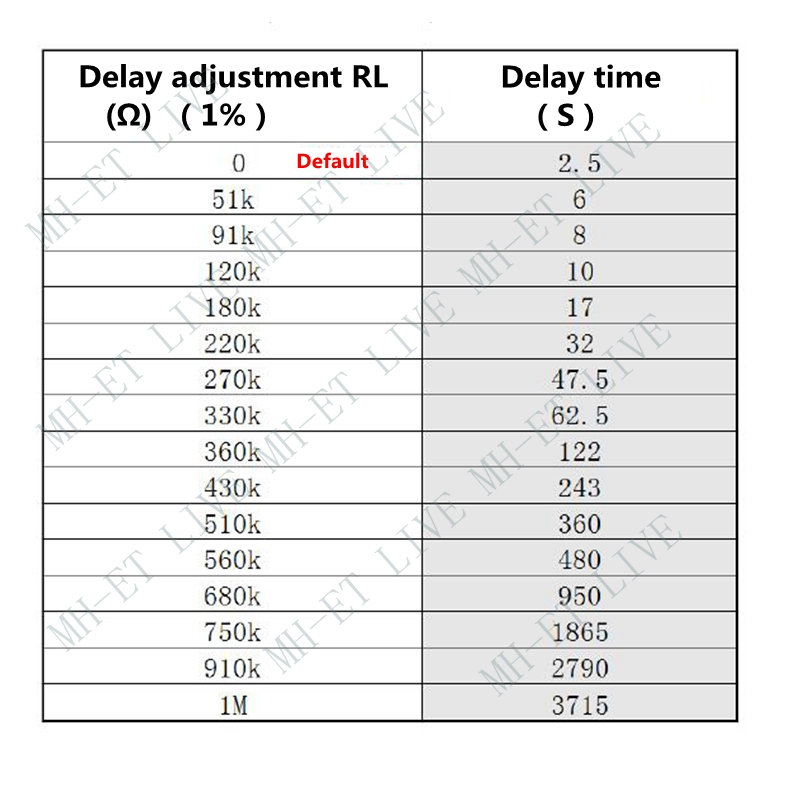 Please read the resistance value corresponding to the typical delay time. Refer to the relevant form below. Blocking time, 2 seconds, not adjustable. The factory is defined as repeatable trigger and cannot be changed. 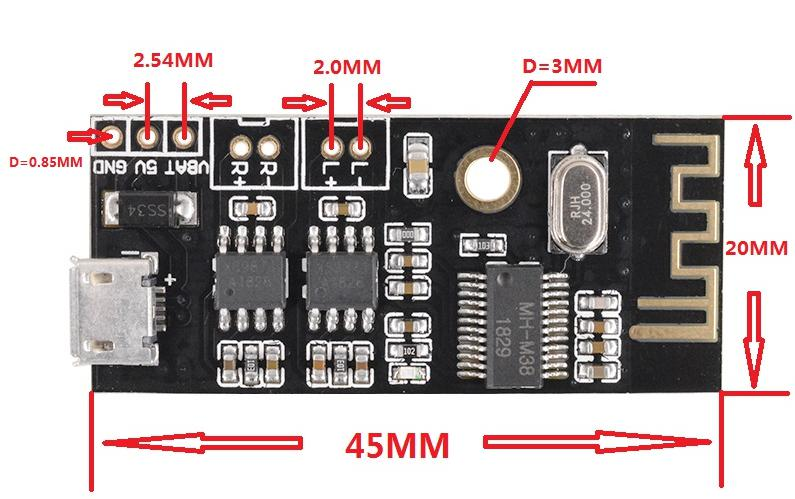 The supply voltage of this module is 3.3V to 15V, and the limit voltage is 2.8V to 18V. The startup time after entering the normal working state after the electric power will increase. 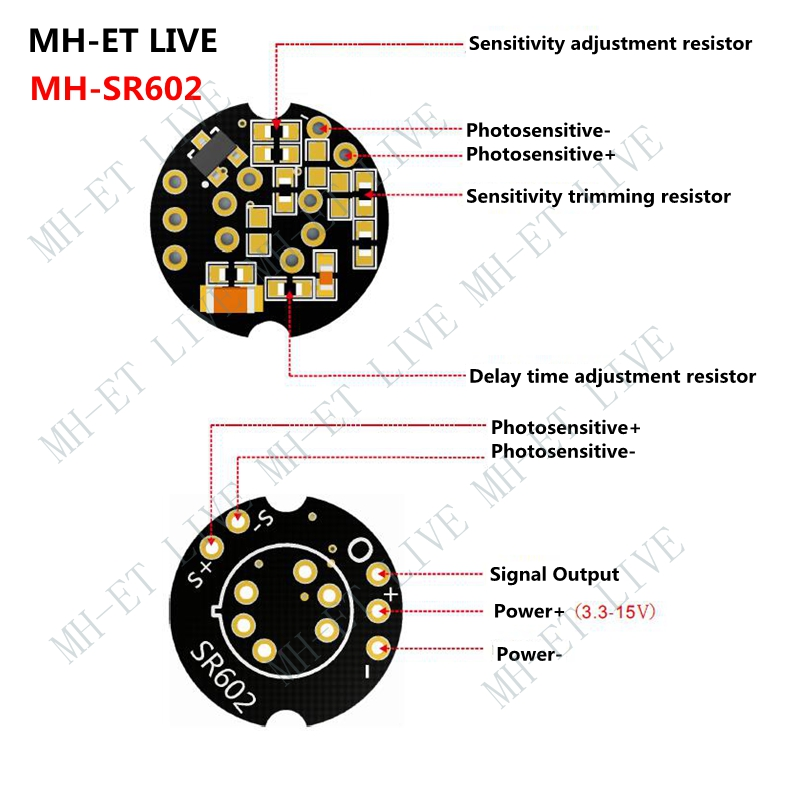 It is considered that there is no photosensitive element installed. 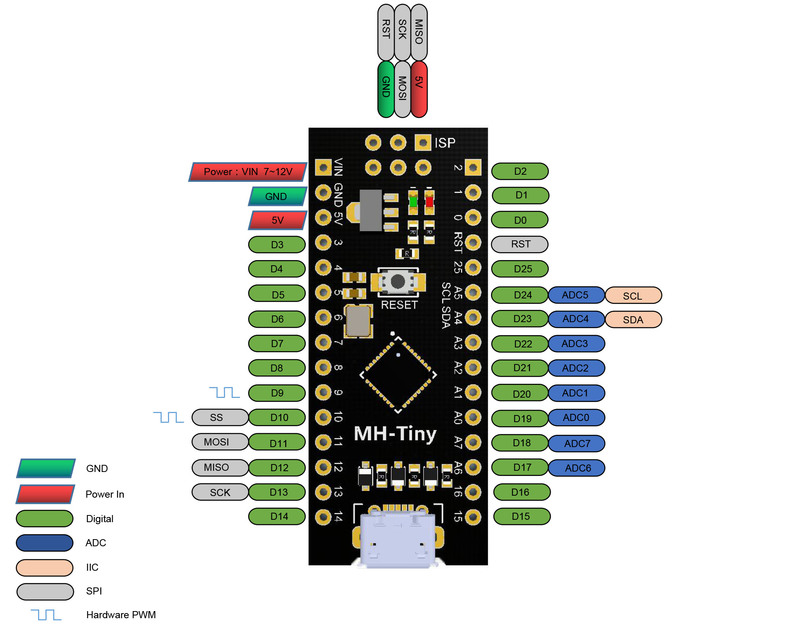 The sensitivity of this module is adjustable, and you need to change a chip resistor. Please read the relevant table below for details. 24V low voltage soldering iron, such as domestic white light 936. 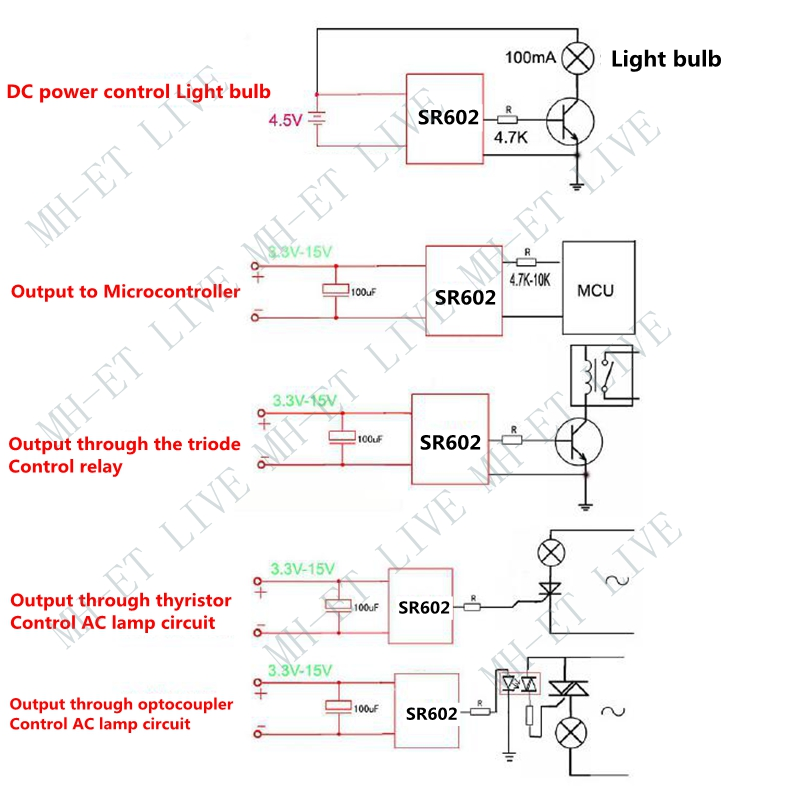 If you follow the MCU and connect the lamp, please read the reference circuit diagram below. The default delay of this module is 2.5s. The above table is the data measured by the laboratory. 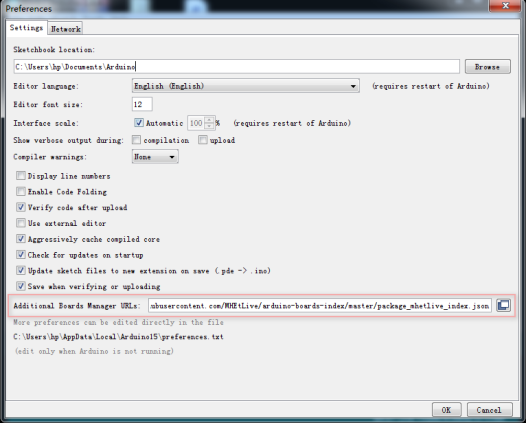 The specified error is only a reference for the debug time range. If you need to change the delay time, please combine,In the actual use case, select the appropriate parameters after debugging the specific circuit. When the module is charging, the output will switch the external power supply (it will be powered off for 0.3s). 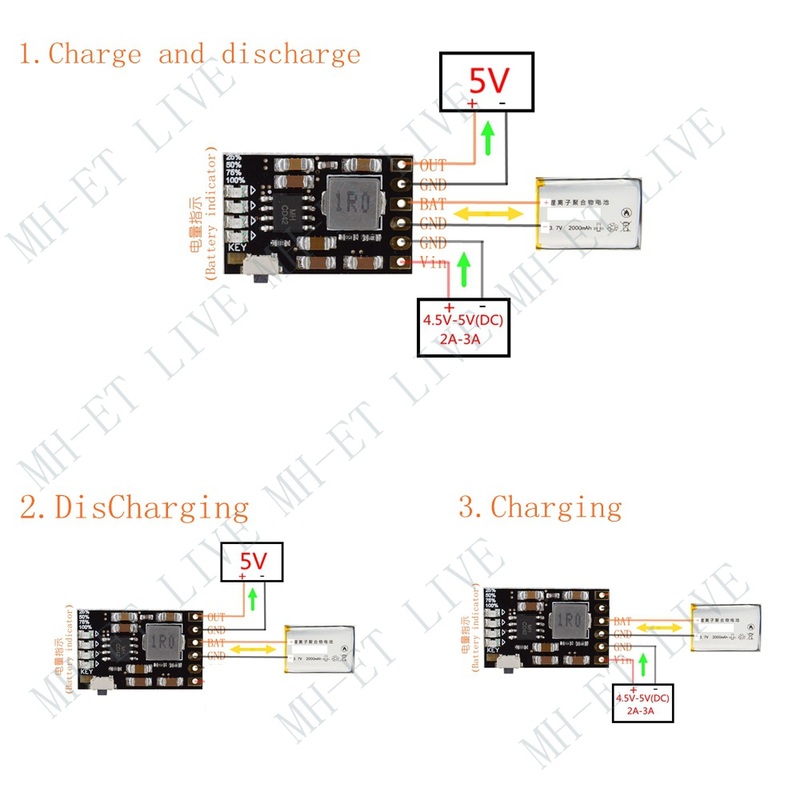 The charging output voltage will be less than >4.7/<5V, depending on the charger load capacity! 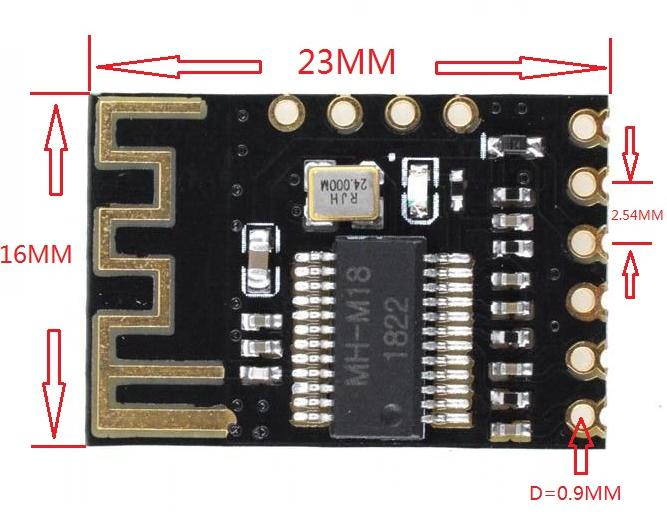 Connect the user of the single-chip microcomputer, if the small load KEY can be connected to the single-chip 20S to give a low level, the module can continue to work. The use of this electronic product requires a certain knowledge base. If you do not understand, please be careful to buy it. Otherwise, it may be damaged due to improper use or over-range use. Thank you for your understanding and support. 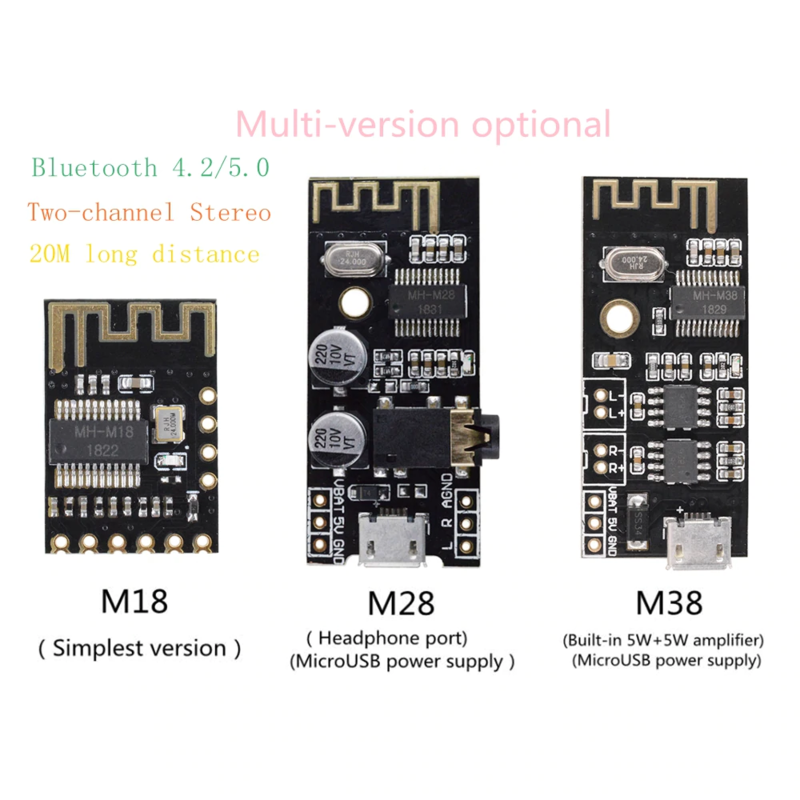 Bluetooth V4.2 version, support Bluetooth automatic connection technology, support WAV/WMA/FLAC/APE/MP3 lossless decoding, stereo dual channel output. 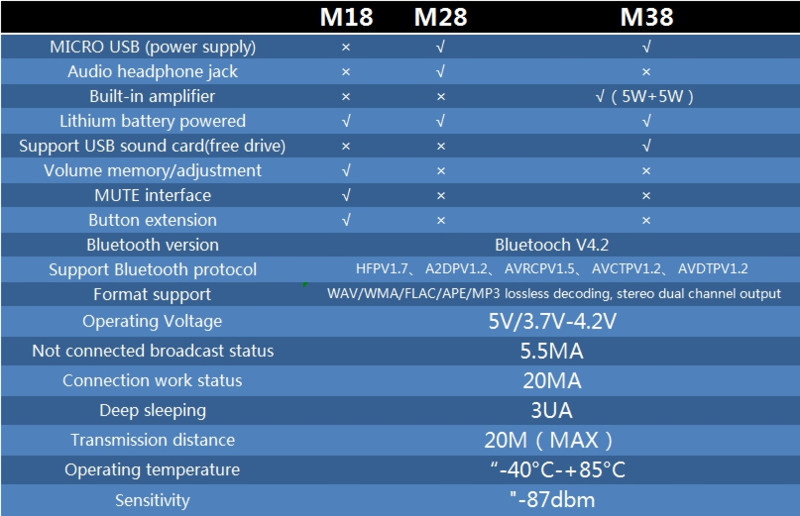 After the module is powered on, the mobile phone searches for the Bluetooth name MH-M18/MH-M28/MH-M38, and can play music after connecting Bluetooth. 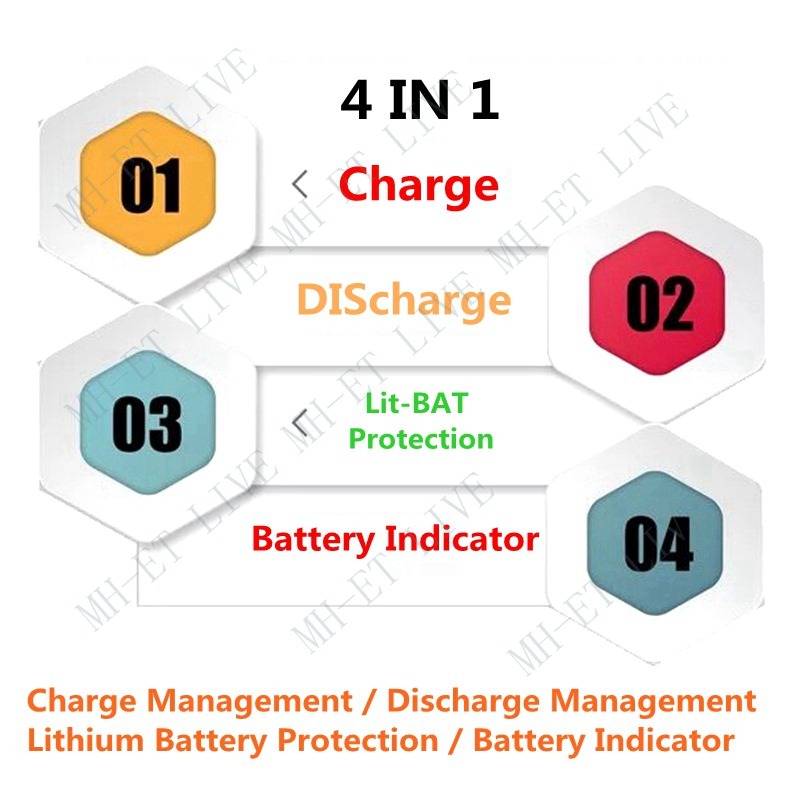 Power supply: You can directly use the MICRO USB Android cable 5V for direct power supply, or you can also connect 5V power supply or 3.7V lithium battery (as shown below). 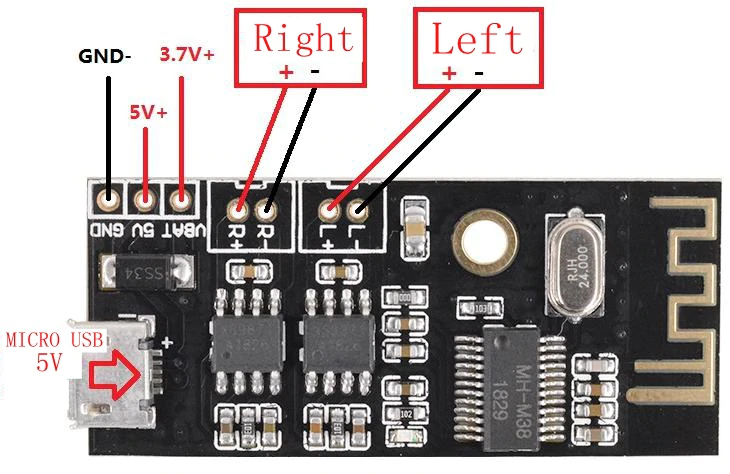 Note that the 5V and 3.7V power supply interfaces are different. 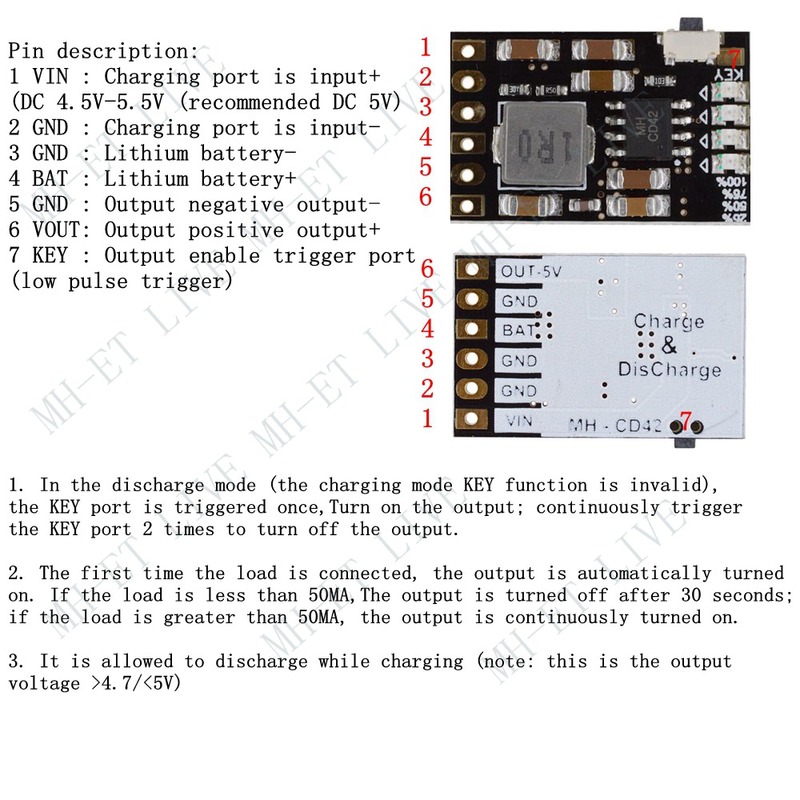 The 5V voltage is connected to 5V and GND, and the 3.7V lithium battery is connected to VBAT and GND. 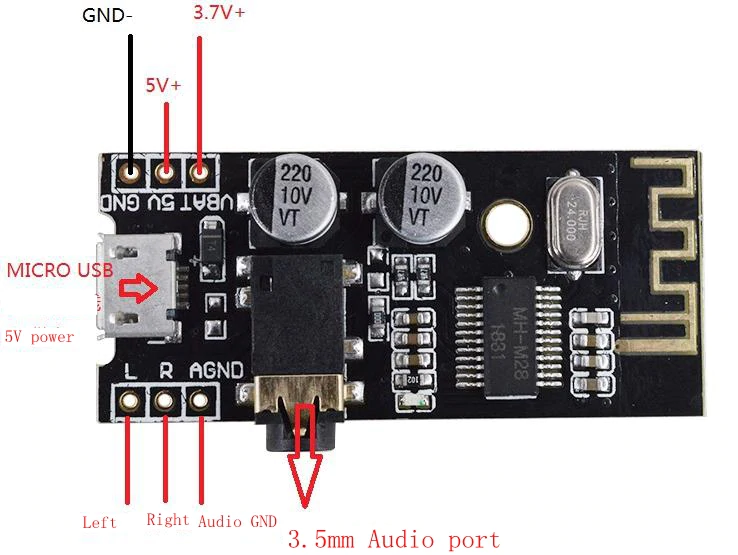 Audio output: The earphone can be directly connected to the 3.5mm audio interface, or it can be wired for the audio input of the power amplifier board (the interface L/R/AGND can be directly wired as shown). 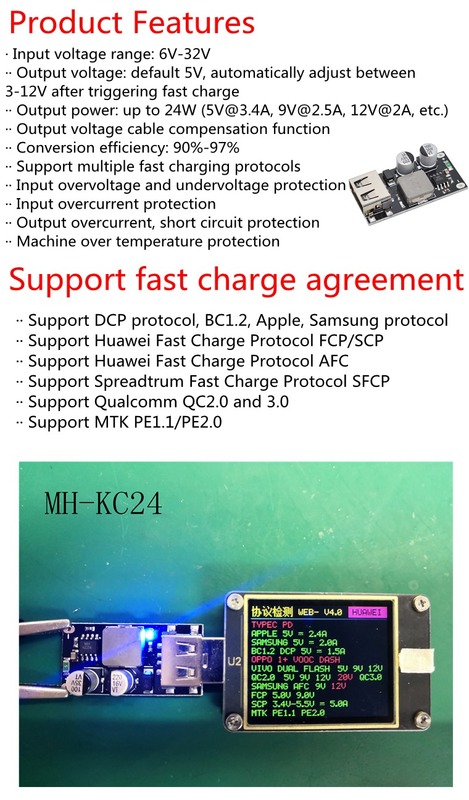 The maximum operating current is 5V2A. 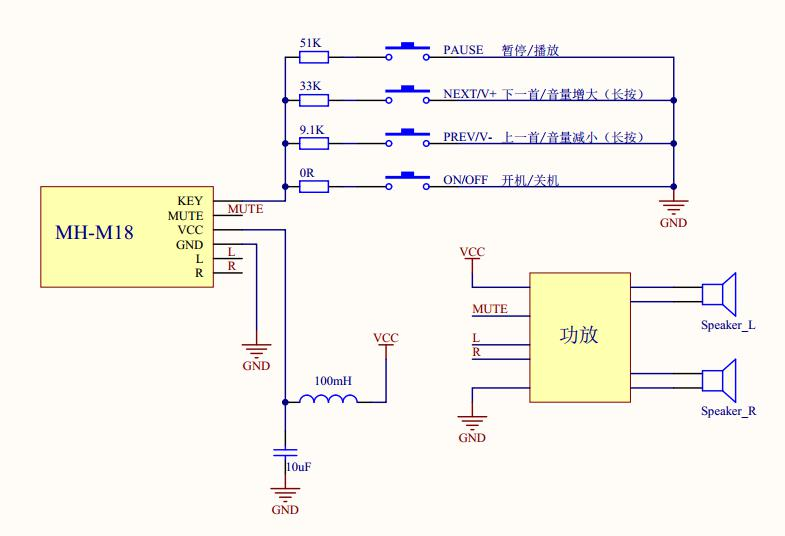 It is recommended to use a regulated 5V2A power supply for better sound quality. Support USB sound card, free drive (plug and play). 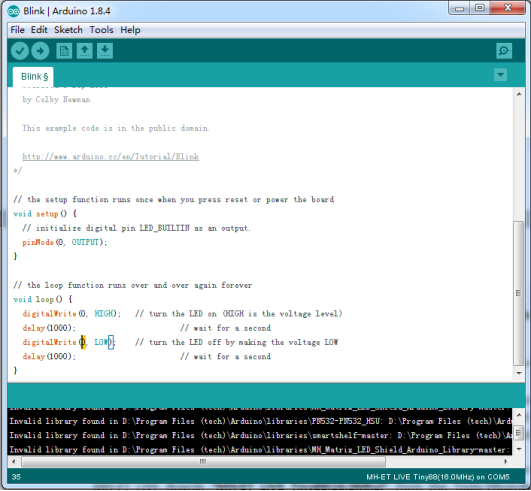 Connect the module to the computer with a USB cable, and the computer can play music through the module amplifier output. Audio output: output left and right stereo audio signals, which can be connected to two 2-8 ohm, 3-5W speakers, and 4 Euro 5W speakers. 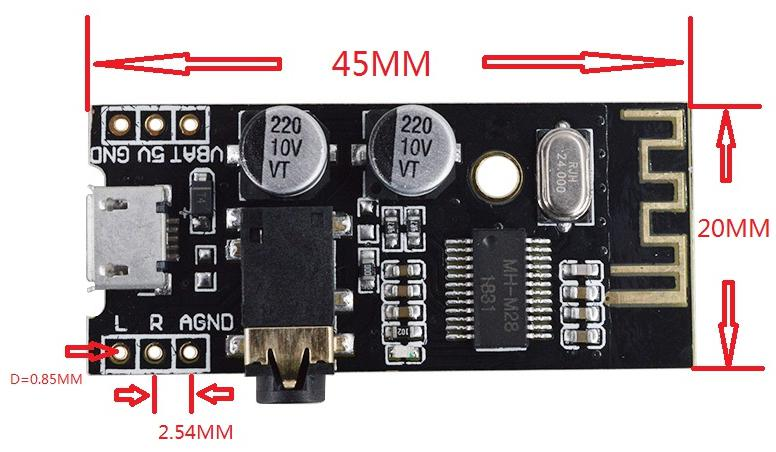 5W power amplifier on board :This product has its own dual 5W power amplifier circuit, and must not be connected to another amplifier! The outputs of the two amplifiers may not be connected in parallel or the negative poles may be connected together, otherwise the power amplifier chip may be damaged. 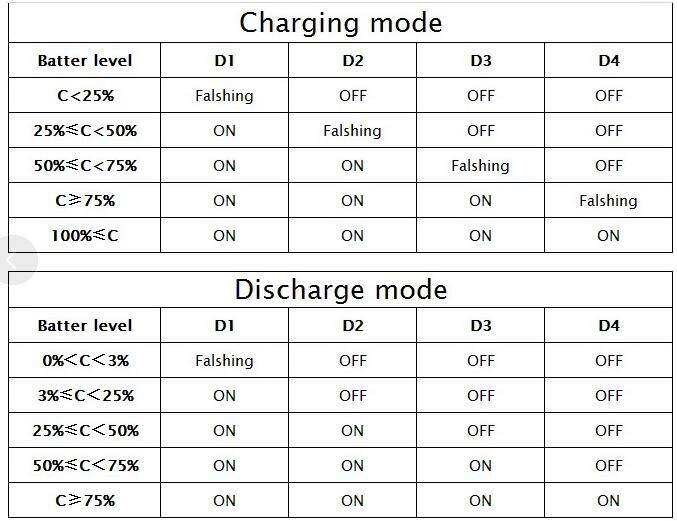 @johnadib No.You can use the MH-CD42 for charging.